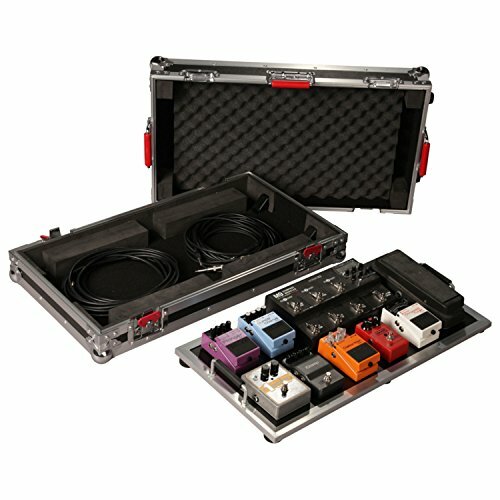 The Gator Cases tour series guitar effects pedal board provides serious protection for guitar effects pedals. The G-TOUR series guitar pedal board also features an extra large removable pedal board with a usable surface that measures 32” x 17”. the interior protection includes thick pro grade shock absorbing EVA foam. The pedals fasten to the removable pedal board with the provided 3M dual lock. Plenty of storage space for cables and accessories exist under in the lower portion of the case. The exterior of this amazing guitar pedal board boasts a thick plywood frame and aluminum valance for ultimate protection. The pedal board case also features Gator Cases signature heavy duty spring loaded red rubber grip handles and robust, recessed butterfly latches. Pedal board surface 32 x 17 inches.